This invaluable Telephone Directory was started by Mauveen Moore when she realised that there was a gap in the market. Being the entrepreneur that she is, she seized the opportunity with both hands and produced this excellent directory. Most people will admit that when they need a telephone number the first thing they look for is their Blitsgids. Not resting on her laurels, she very soon branched out and produced a Blitsgids for not only most of the small towns but also the bigger towns like Hermanus and Worcester. 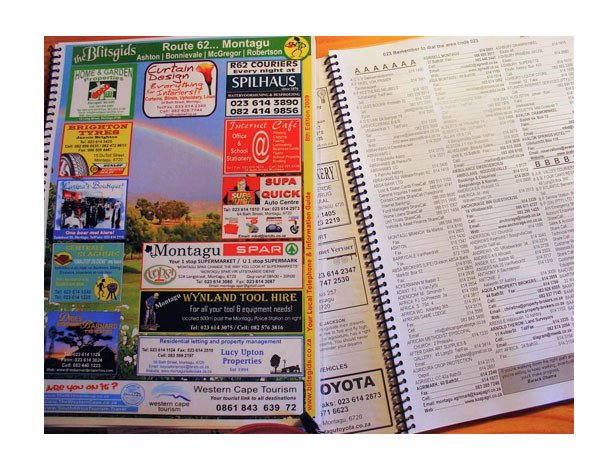 This is not a boring telephone directory - funny sayings and quotes break up what would be a boring, straight forward telephone directory, and the glossy adverts create color and vibrancy. You can even find the most mouth-watering recipes interspersed between the telephone numbers! The useful information on each town makes for great reading and the emergency numbers that are prominently displayed is most useful in times of emergencies. Everything has been thought of, if you need to find a street just go to the street maps and voila! no longer lost. An invaluable tool for every household or business. The Blitsgids comes out once a year - grab one while you can!